One look at this gorgeous Fusion Hybrid and people fall in love! It is a vehicle with high fuel economy and Plug-In functionality. Don't forget the sharp looks, great performance & tons of high tech feature that will make anyone jealous of your New ride. Overall, Ford has designed this Fusion to look like an expensive European luxury Car. Aggressive headlights and grill that looks like Aston-Martin adds extra oomph to its overall look. The interior is quiet, spacious, elegant, and attractive and is crafted with soft-touch surfaces. 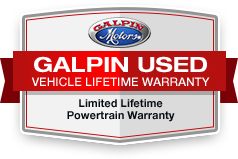 Call us today so we can help you get into this dreamy family sedan experience 'Galpin Used Car Difference'. All figures are EPA estimates. Actual mileage will vary. Kelly Blue Book values are calculated based on the current Retail Book. Pricing analysis performed on 12/21/2018. Fuel economy calculations based on original manufacturer data for trim engine configuration. Please confirm the accuracy of the included equipment by calling us prior to purchase.